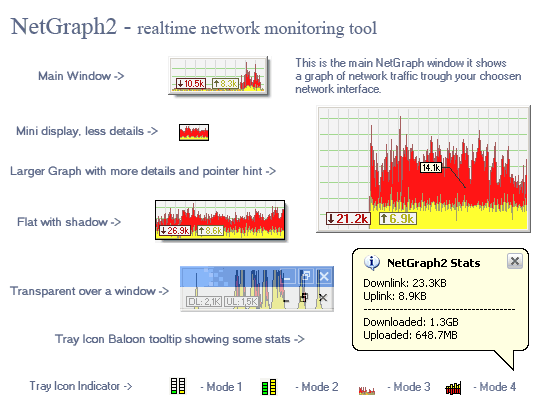 NetGraph is a network monitoring tool with a very small footprint. It shows a graph of your incoming and outgoing network activity on a selected network connection in realtime. Unlike some monstrous packages full with useless stuff this program is designed to be very light and to stand off your way. There is also a daily traffic log which you can use to track your daily traffic. Note: The latest version of NetGraph2 is compatible with older windows platforms up to windows XP. It does NOT support newer windows versions from vista on! Looks like exactly what I want! Where can I download Netgraph2? What is the latest version? Nikola, I’ve been looking over your site from page to page and I cannot find where you have any links to download any of your programs. I am mostly interested in nPassword and NetGraph2 but the others look helpful as well. I have viewed the pages in Chrome 13 browser as well as Internet Explorer 8 and I cannot find any links to downloads. Maybe I’m just blind or ignorant, but I’m not finding any download links. Could you help me, please. And where do I download this? Please put the URL for download,thx! You’ve written an excellent utility, that I have used for several years. However, when I come back here to see if there have been any updates, I’m always disappointed that you don’t post any “current version” info. That would be helpful even if you’re not updating the product anymore. I think it would also allow more users to enjoy your work if you would post links to places where the product can be downloaded.